The fourth Developer Preview and 3rd beta of Android P has been released to those in the Android Beta Program today. The update is a few days later than expected. According to the timeline Google published when Android P was announced, Developer Preview 4 was slated for a late June release. The update is just under 300 MB and is already rolling out to those who have devices registered in the Beta Program. I currently have my Google Pixel XL in the program and the OTA update has already been received and installed. As far as new things are concerned, you won’t find much. There are a tweaks here and there throughout the build but no major feature changes. That said, the new ability to manually toggle a light theme or dark theme in the Display Settings is now an option. 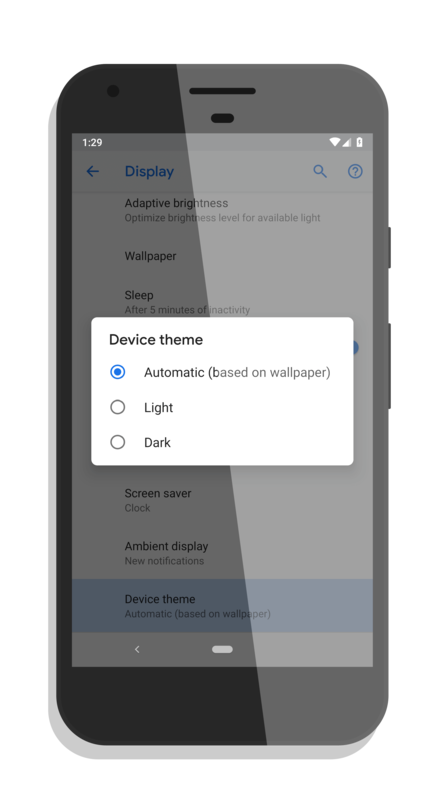 You can now have your phone select the theme based on the wallpaper you have on your device, or you can force either a Light or Dark theme to your liking. There are a few other cosmetic changes throughout the update but again, nothing major or orbit altering. To give you an idea of what I’m talking about, check out the screenshot above. Note that the back button is now an arrow in the new Gestures driven interface. While this preview of Android P certainly feels solid and stable, if you decide to install it on your phone, keep in mind that it is still beta. You could run into performance issues or other show stopping bugs. It is certainly possible to run it on your daily driver phone but not recommended to do so just yet. With the Release Candidate expected sometime in late July or early August, it may be worth waiting until then if you are concerned about it.